Sysessential for DBX to PST Converter software is a known email conversion application associated with migrating all the emails from Outlook Express into Outlook PST files. The best features in the tool cut down all the hindrances users usually encounter while exporting email data from one email client into another. Migrate data effectively without losing any email at all. Export Outlook Express emails into Outlook PST files completely. Here complete conversion is associated with migration of all the folders, metadata information, email properties etc. Even when data is in bulk then also software initiates its vital and advanced technology and move DBX files into PST at one go. Sysessential for DBX to NSF Converter is an efficient software solution that never alters email formatting at any cost. It retains email hyperlinks subject, header style, attached files, email header and so on. The application is supportive of all the MS Windows editions including Windows 10 along with other versions as well. Thus, if you are using any of the Windows edition, you are eligible for using this commercial tool. While utilizing application, you won’t come across any sort of errors. It is a simple tool which only aims at migrating emails from DBX files in PST without affecting data integrity and folder structure. Everything is well-maintained and organized so. Software is supportive of converting .dbx files into .pst file format and in the entire conversion process; there is no room of data loss like unexpected scenarios. No changes will appear in formatting as well. Sysessential for DBX to PST Converter is low in cost and high in efficiency so convert the emails easily into Outlook PST file format. Less cost does not affect working of the software at all. Every user is little apprehensive prior using any software application. This is why most of the software companies provide freeware demo run. 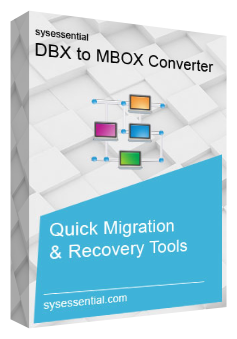 Test the tool’s capability and steps used for migrating DBX files into PST file format. This way you will be clear what is really instilled in the application. It is worth to convert first 10 emails from all DBX items into PST file. The conversion of the software is easy to understand and help to recuperate the conversion ways. It supports converting entire DBX files into PST without leaving behind any single detail. The application is fully supportive of all MS Outlook editions such as 97, 2000, 2010, 2003, and 2002 etc. Who mostly use Sysessetial for DBX to PST Converter tool? The typical users of Sysessetial for DBX to PST Converter software are home users, enterprises, agencies, SMEs and agencies. Which Operating System software is compatible to work with? The application is supportive of working with Windows OS editions and in all the editions. What is the payment method employed for buying Sysessential for DBX to PST Converter tool? Explain the benefits of choosing Sysessential for DBX to PST conversion application? In cutting-edge technological world, Sysessential for DBX to PST has special place. It works smoothly and takes away all the emails from Outlook Express email application into Outlook. In addition to this, the application is absolutely effective and hassle-free in understanding the conversion steps involved. You can run it anytime once it is installed on your computer machine. Being safe from external threats, it does not pose any threats to data integrity. Wow!!! I am happy to have incredible software such as Sysessential for DBX to PST Converter for simply converting mailbox items. The currently software application consisted of smart working steps and seamless conversion techniques. I tried the application in free demo run which cleared out all the tribulations I had in my mind. After that I invested in the tool and converted all the emails in PST file format in just one go. I got the chance to use Sysessential for DBX to PST Converter application for making rapid conversion of DBX files into PST file format. Actaully I was looking for systematic and effective software application for smooth migration of DBX files. Multiple benefits of the tool retrieved all the emails into newly shifted Outlook emailing application. Now, I am comfortably able to access entire email information into PST file format.